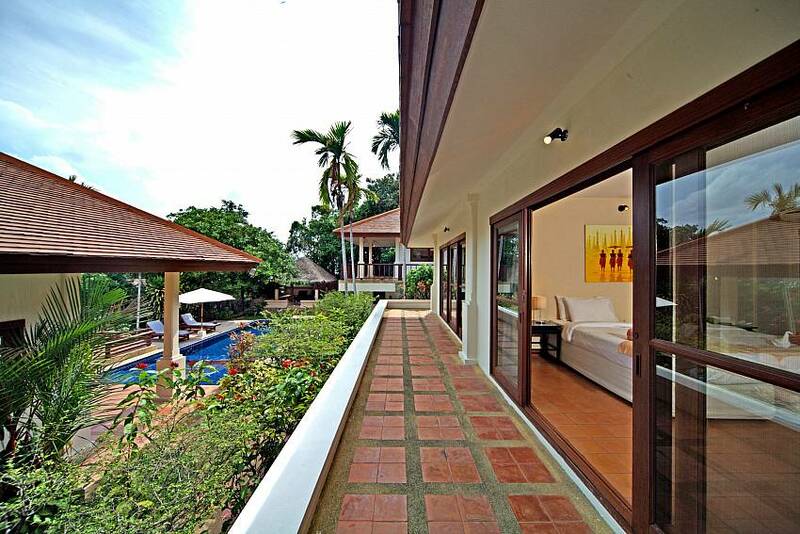 Enjoy the ultimate in privacy and relaxation at the 3-bedroom Summitra Pavilion Villa No. 9. 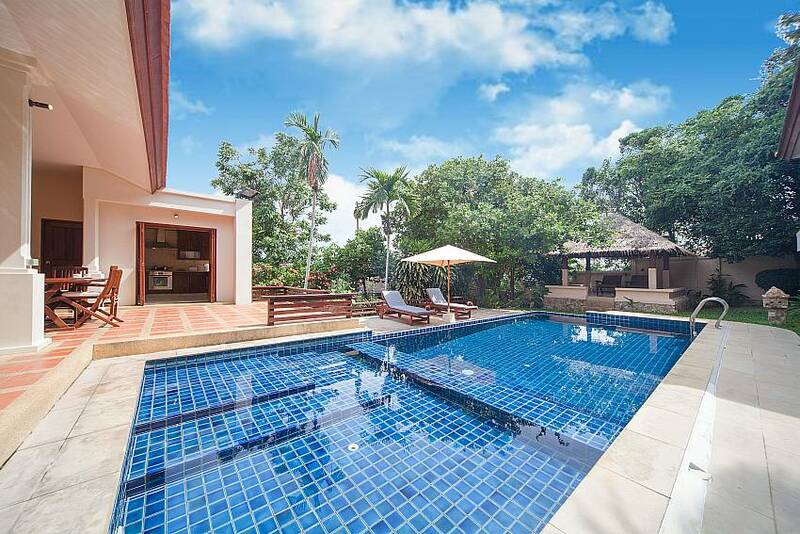 Perched in the hillside above Choeng Mon Beach, this uniquely designed villa has a private pool and beautifully landscaped gardens with a “pavilion” style layout that puts you at one with nature and provides plenty of space for your group. 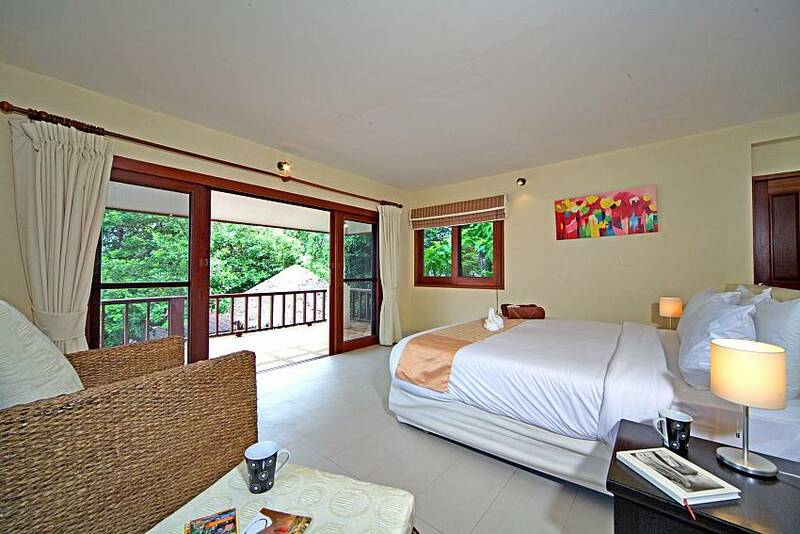 If you’re looking for the perfect place for your small group at an affordable price, surrounded by nature, Summitra Pavilion Villa No. 9 is the answer. 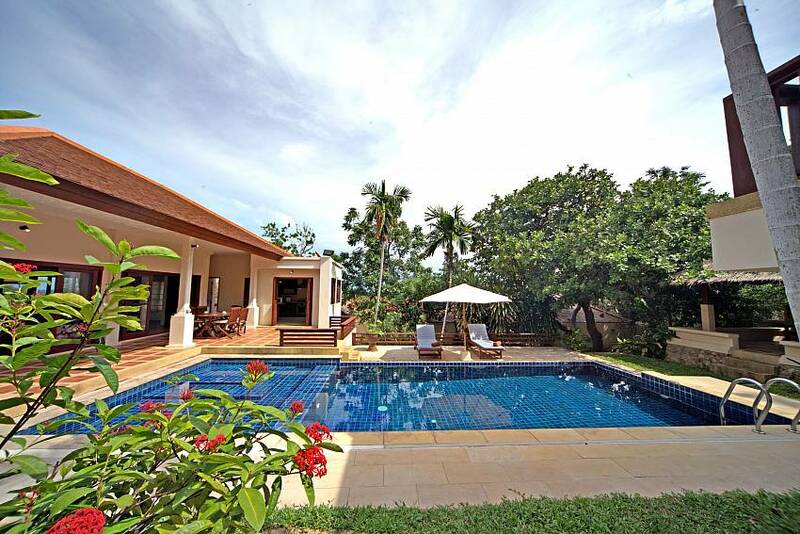 The private swimming pool is set in a beautiful natural atmosphere ringed by separate pavilions which have living, sleeping and lounging areas. 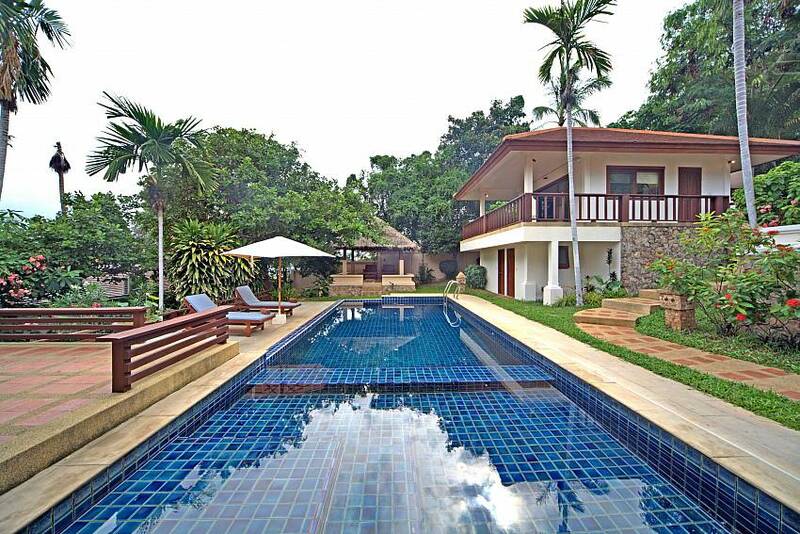 The swimming pool and terrace take center stage at this villa. 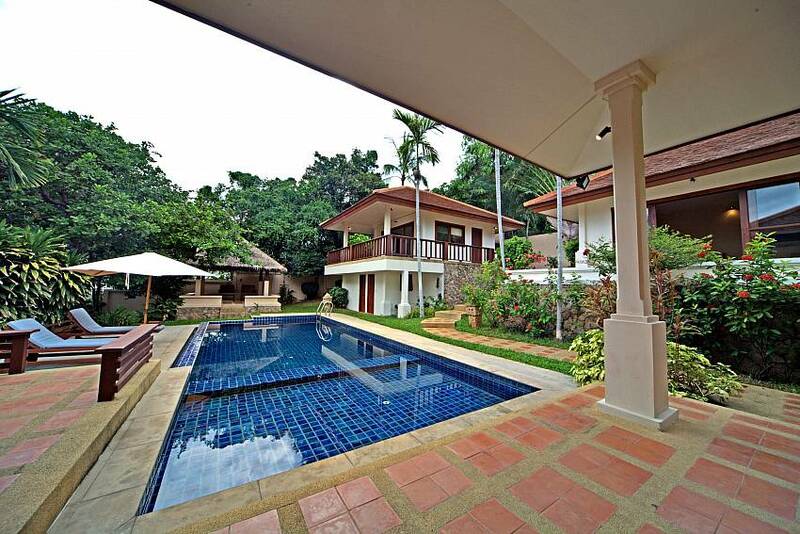 The pool has a shallow, stepped area – great for the little ones or just lounging – and a deeper area for a true soak. 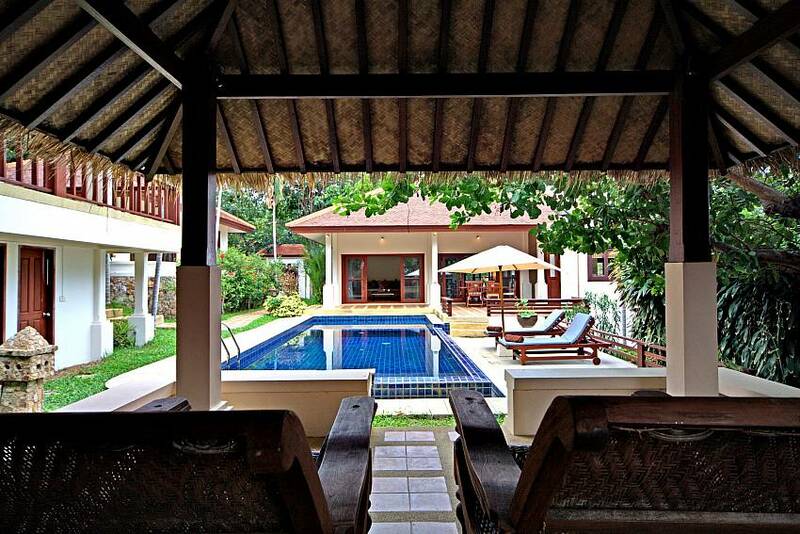 The garden is filled with mature tropical plants and the terrace has loungers with umbrellas as well as a traditional thatched roof sala. The best part of this design? 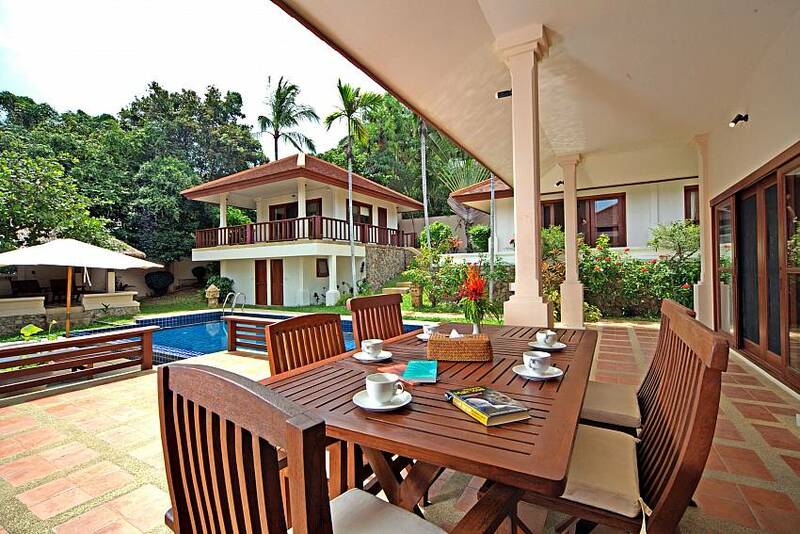 This exclusive villa estate is laid out to provide absolute privacy between the villas. 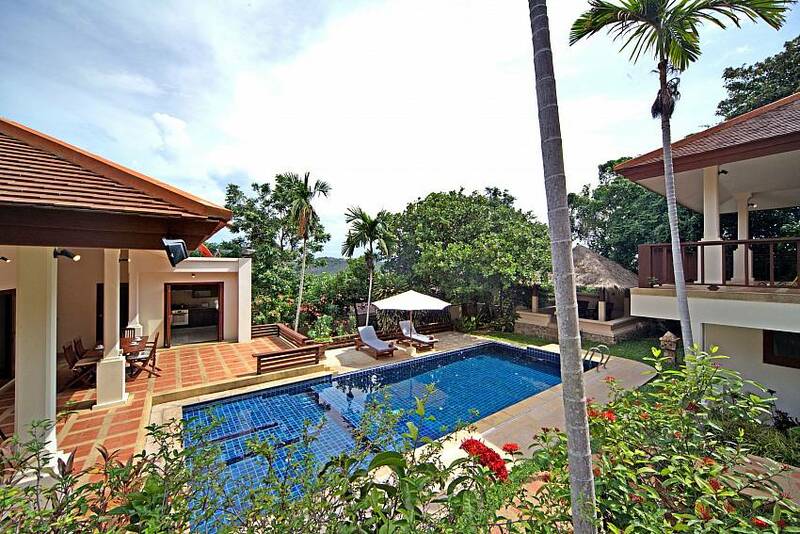 Each of the pavilions overlooks the stunning pool and garden area. 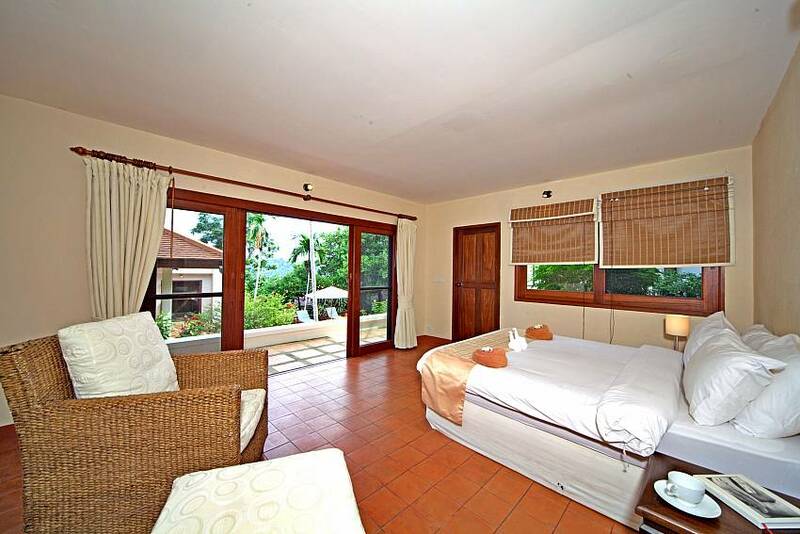 The living area has an airy open plan layout with kitchen, dining and lounge offering roomy couches and cable TV/DVD. The second, outside dining area is sure to be a favorite place. Al-fresco snacks and main meals will be taken in a wonderful setting. 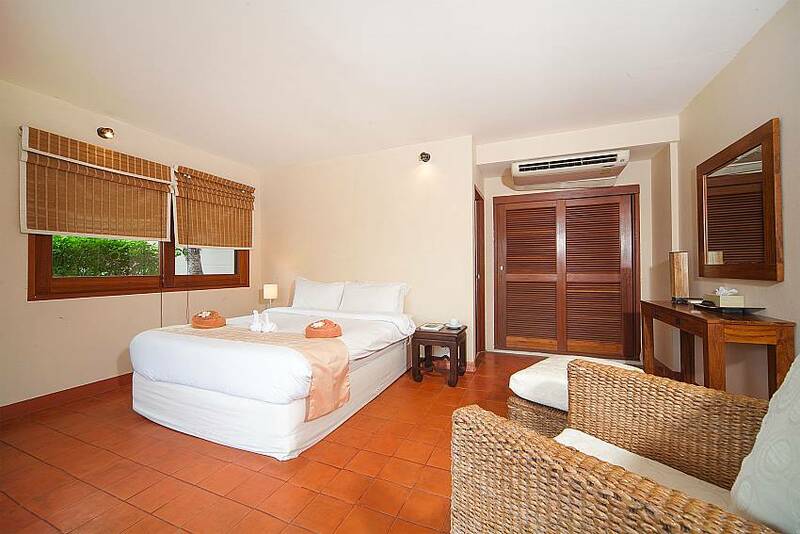 The bedrooms each have separate access from the terraces and come with en-suite bathrooms. All of the interiors are air-conditioned, and the design ensures that everyone in your party enjoys space and privacy as well as togetherness. 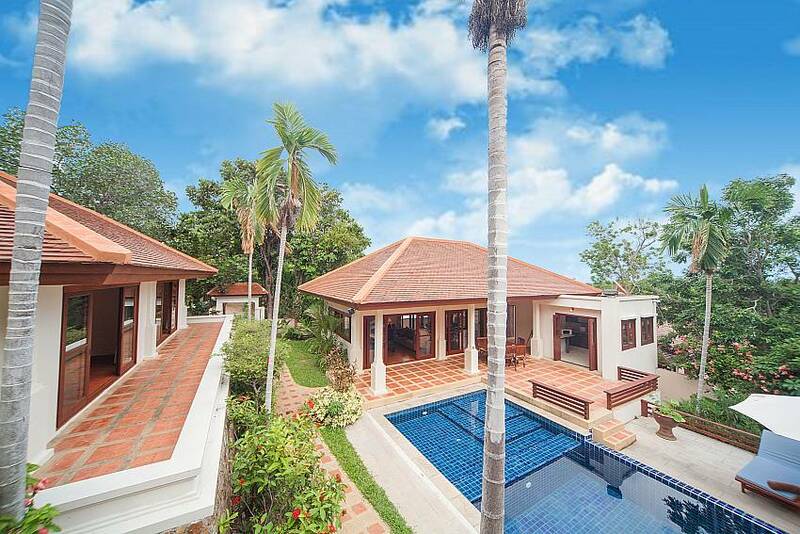 The villa estate sits high on a hill above Choeng Mon Beach and offers private tennis court facilities with balls and rackets on offer at the estate office. 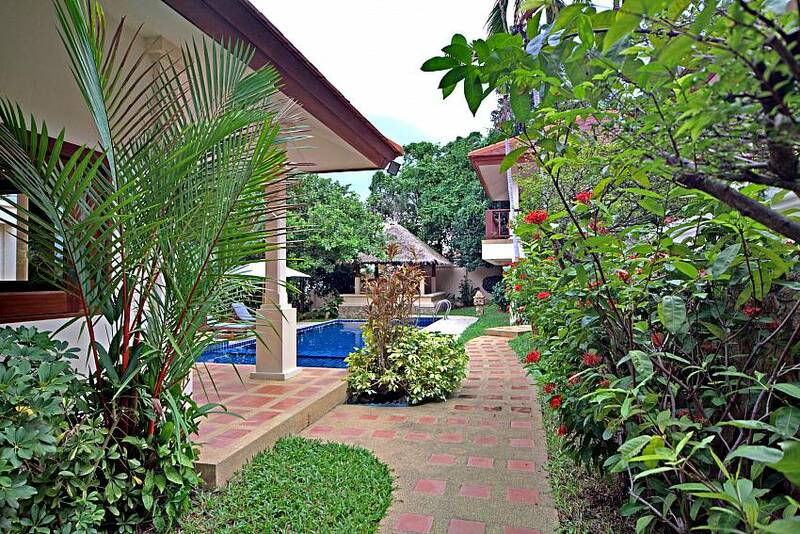 Once you close your gate, this piece of paradise is totally self-contained. 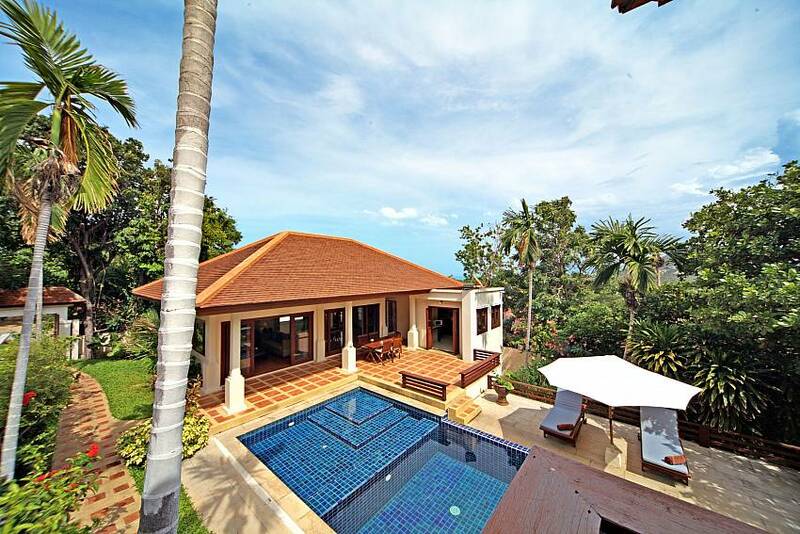 Set high on the hill above Choeng Mon Beach, the villa is caressed by sea breezes. Choeng Mon is a gorgeous sugar-sand beach with far fewer tourists than Chaweng or Lamai Beaches, perfect to continue your holiday reverie and is reachable on foot. 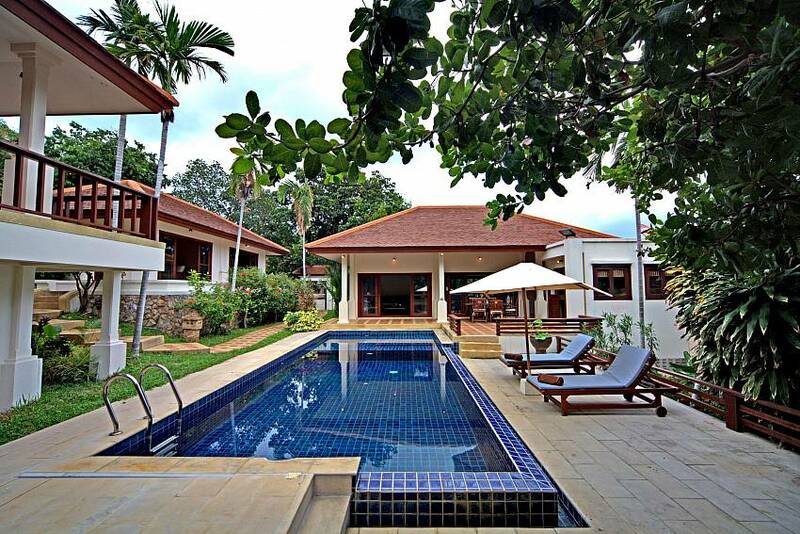 When it comes to the rest of the Island, the easiest way to explore the area is by car, which gets you to the hotspots in Chaweng or to the Big Buddha in Bophut. 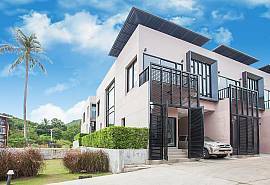 The villa has private parking, and a driver is easily arranged if you prefer to just relax and experience the wonders of Koh Samui. 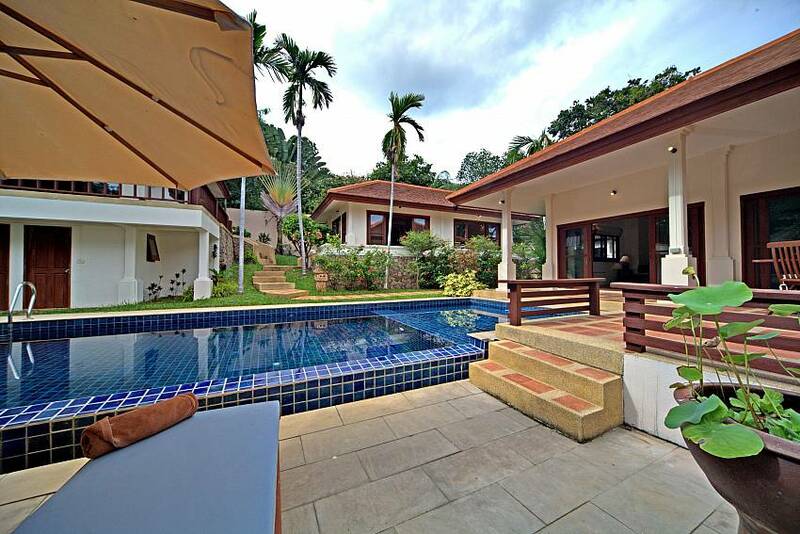 Click to view our unique range of Koh Samui properties and holiday homes here. 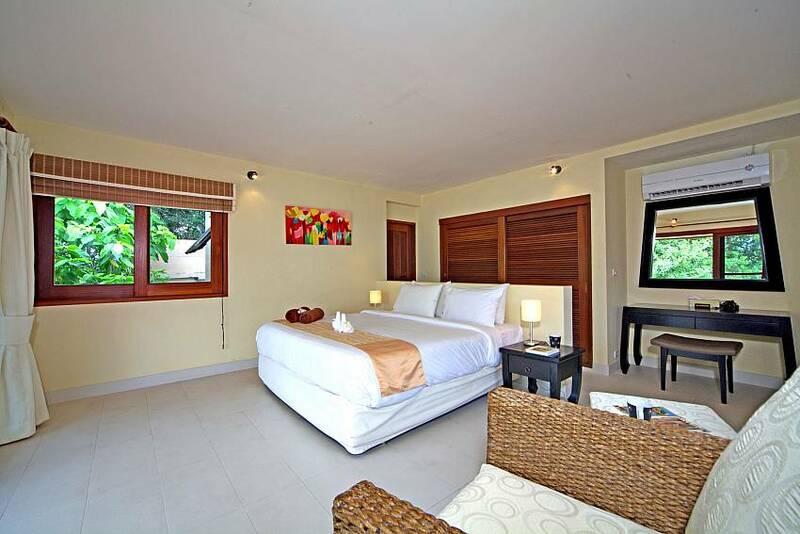 Each one of the three bedrooms is accessed via the outdoor terraces and provides wide views of the natural surrounds. They all have en-suite bathrooms and air-conditioning. All bedroom designs are simple and relaxing in neutral colours that put the spotlight on the fantastic views. 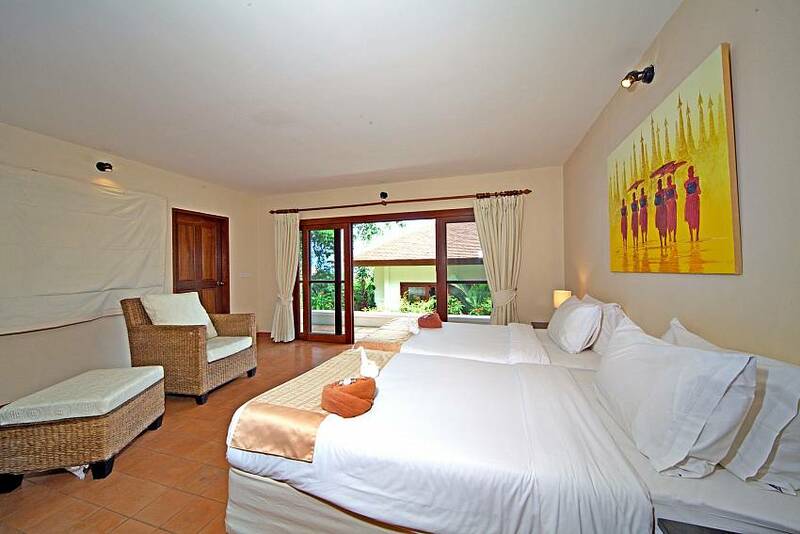 Two of the bedrooms have double beds and one has two single beds. 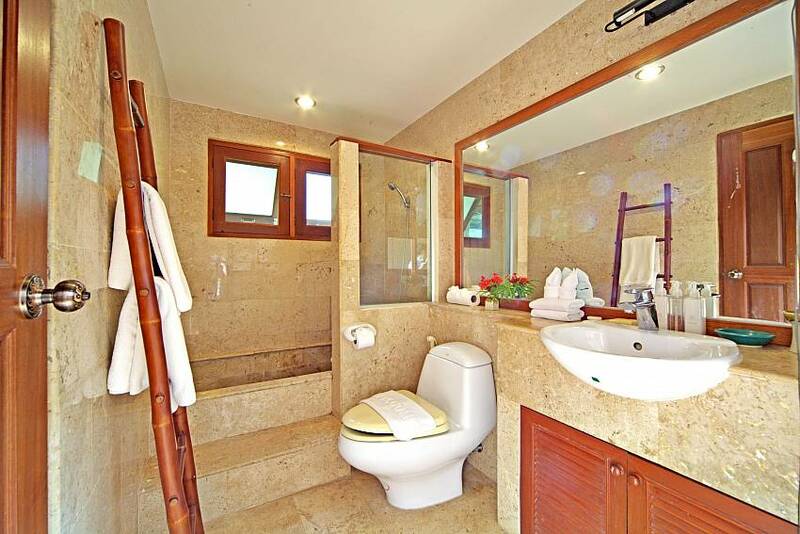 The bathrooms, all en-suite, are finished in glowing, polished stone and provide all the modern conveniences. 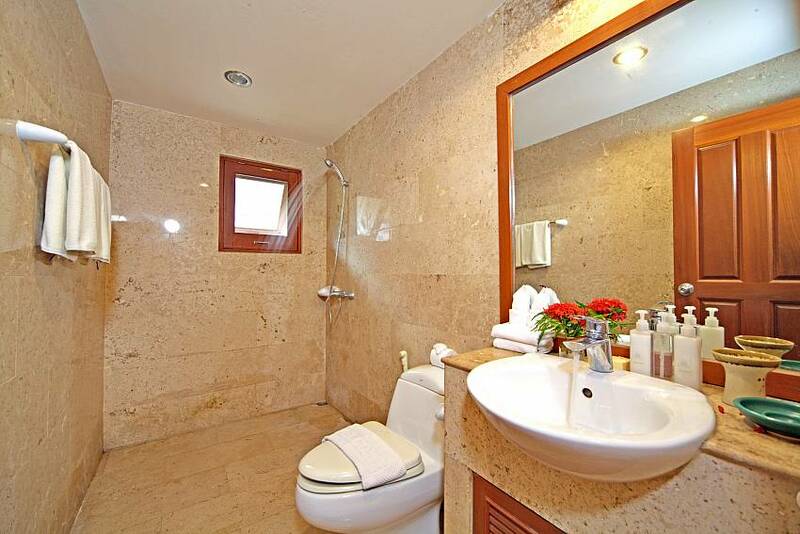 They have modern fixtures and separate shower areas. 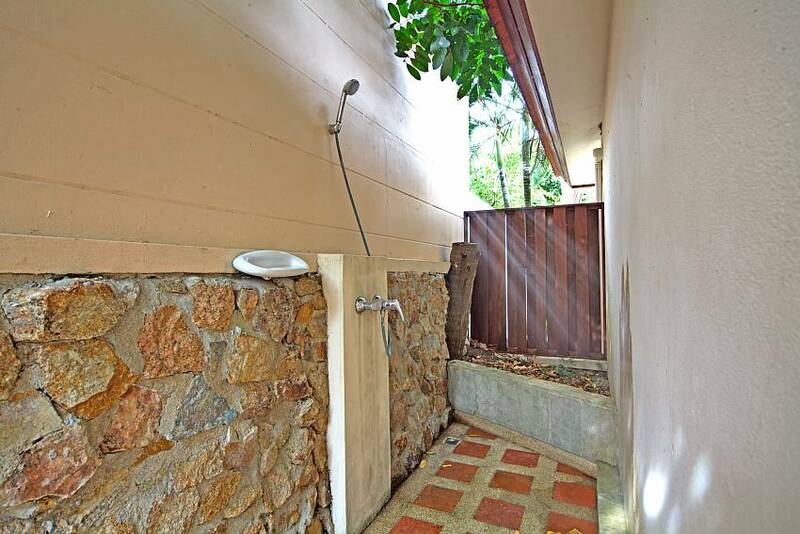 There is even a Balinese-style outdoor shower garden for bathing as nature intended. 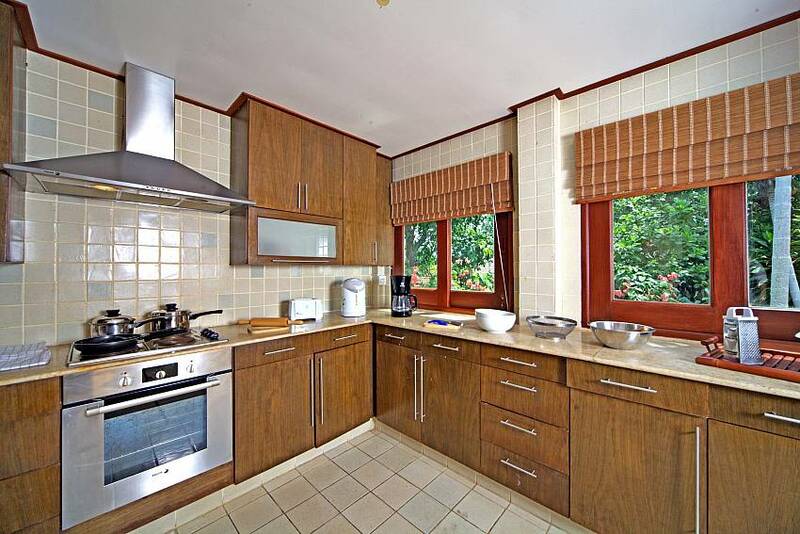 The kitchen is tucked inside the main living area and provides everything you need for your holiday meals together. 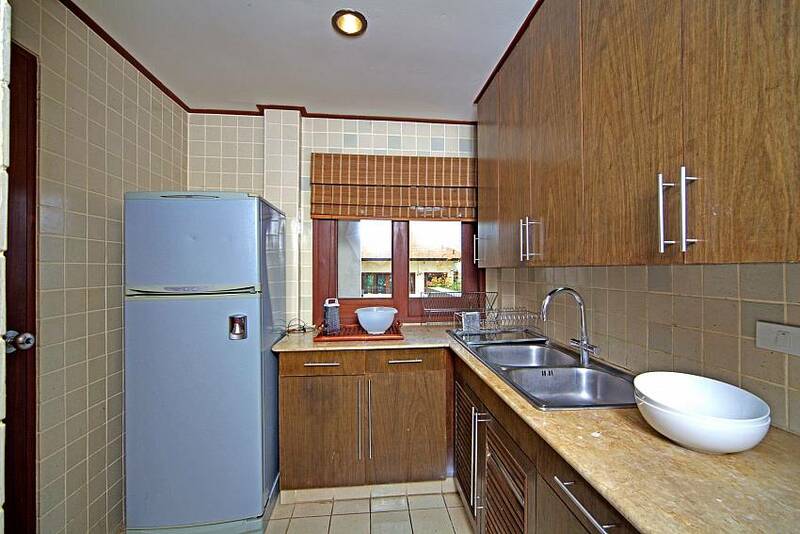 There is a hob, hood, oven, and refrigerator, along with kettle, coffeemaker, and cookware, dishes, and glassware for 6. Beautiful pagoda flowers outside your window promise a great start to the day. 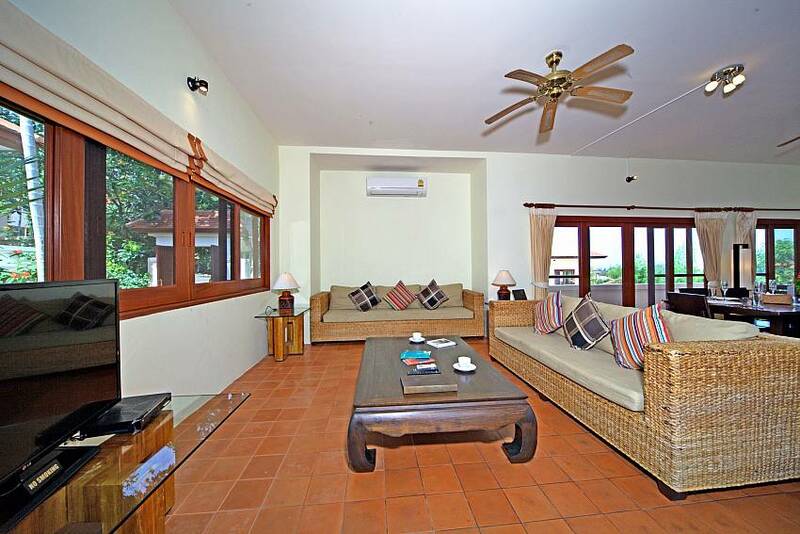 The living area has the same pared-down, natural décor that dominates throughout the villa. 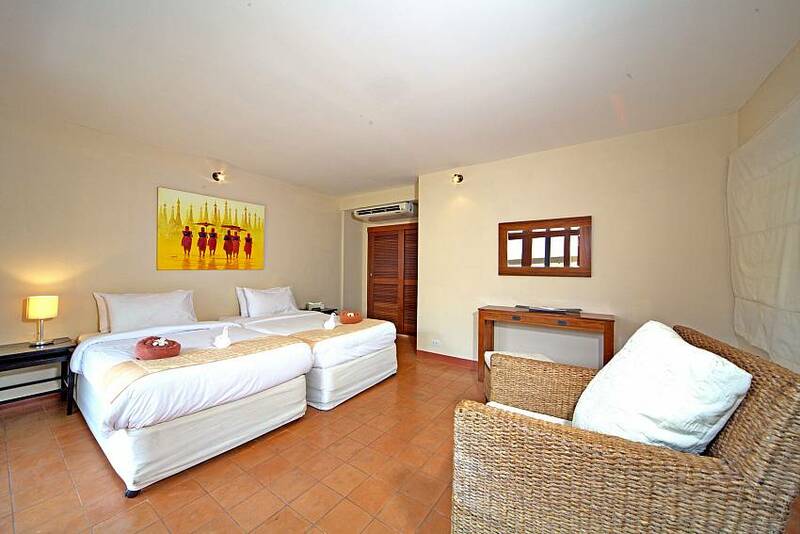 Two water hyacinth sofas provide a great vantage point to admire the view or to watch the cable TV with DVD player. 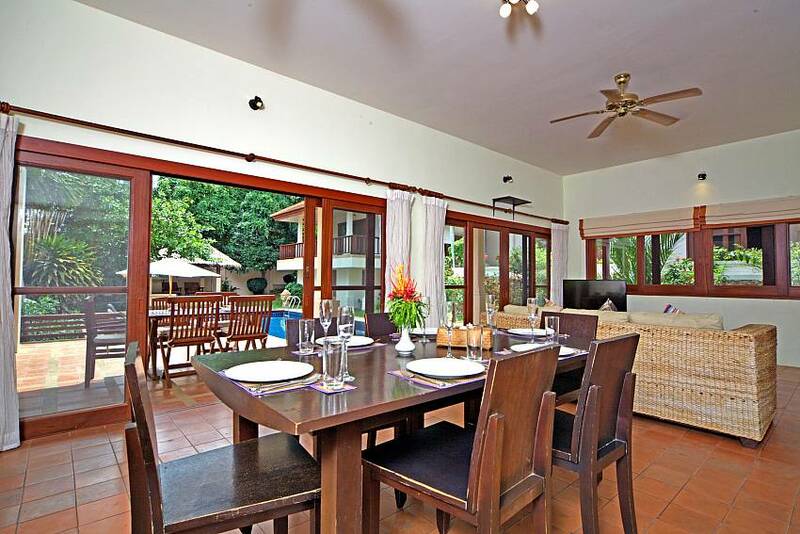 The formal dining area sits inside the air-conditioned living space and features a 6-place dining suite. 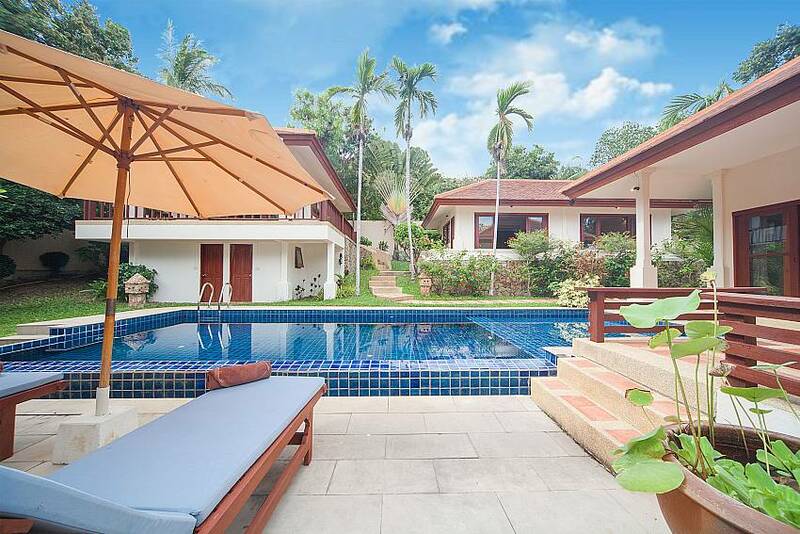 Our bet, though, is that you end up spending more time at the outdoor dining area that sits just meters away and beckons you to breathe in the tropical sea breeze.